Peregrine, book 5 in the Fighting Anthony series is now available in e-formats from our imprint Boson Books! July 1778. A French fleet of mighty warships under Comte d Estaing arrives off Sandy Hook to aid the colonies. The British Navy finds itself hard pressed to fulfill the duties cast upon it. Vice Admiral Lord Anthony has temporarily transferred his flag to the frigate, HMS Peregrine for diplomatic duty. The ship’s captain is Lord Anthony’s brother, Gabe. The mission is to transport prisoners of war and their families to Norfolk, Virginia in exchange for British prisoners. Sailing under a flag of truce Peregrine is viciously attacked. 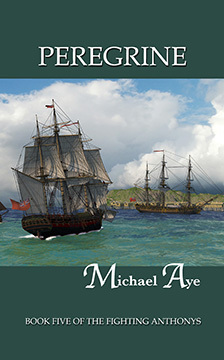 The roar of cannons and smell of gunpowder once again fills the air as Lord Anthony’s ships struggle to do their duty. Available soon at Barnes and Noble, Ebooks, and in print.